There are good things happening in Chicago for people walking and biking, which we've covered in prior posts. Just this week, the city released its first-ever Pedestrian Plan, an encouraging document I'll try to highlight in a separate post. But this weekend, honestly, walking and riding my bike around Lincoln Park and beyond, it was just depressing to see how far we have to go. The state of the crosswalk stripings nearly everywhere is horrendous. Sidewalks are tiny slivers of pavement. 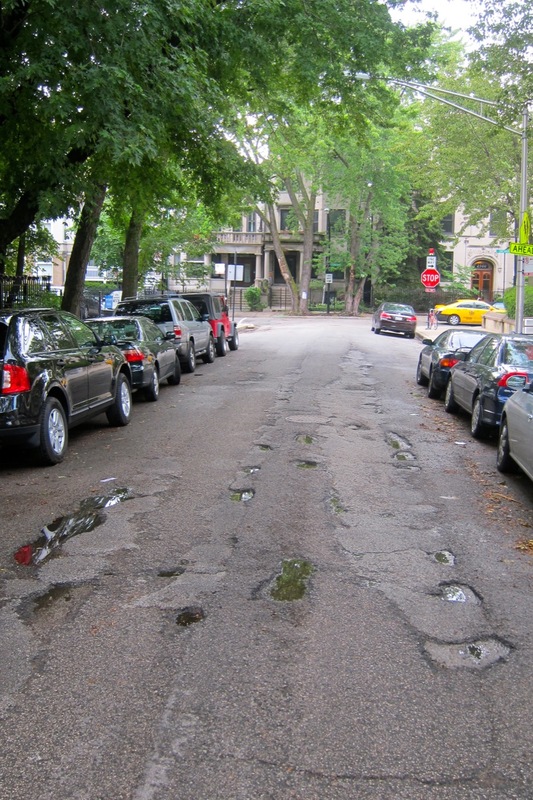 There are potholes on main streets and side streets. Where there are bike lanes, they end at every intersection. On LaSalle Street, I saw four cars parked in a No Parking/Tow Zone/bus stop area, completely blocking the curb cuts for two crosswalks. No tickets on their windshields, and I don't think the owners had any fear of actually getting towed. Pedestrians, be damned. There are good intentions in our current administration, but there's so much work to be done. I certainly don't envy them their task of organizing the effort to fix, maintain, and right-size our streets. I rounded up some pictures I've taken over the last month or two to illustrate. Green City market vendor truck blocking the pedestrian crosswalk on Clark at Menomonee. It's already a horrible place to cross, and this only makes it more dangerous. Just so you don't think it's a one-time thing: It's not. It's every week, every market day. This shot is taken two months after the first one. 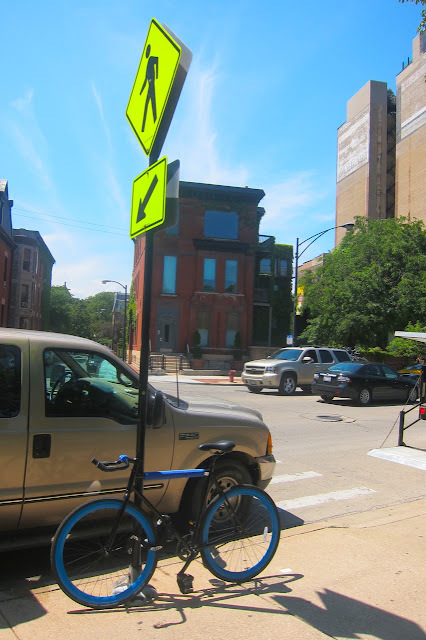 The Halsted Street bike lane just north of Division Street is barely visible. I mean, it's like that for most of Halsted, but this pic is just north of Division. Halsted will be getting a buffered lane, but it's incredible that this barely visible marking on the street is counted as a full bike lane on the map. The crosswalk on Stockton Drive at Belden is barely visible. This is a busy crossing for people headed to the Lincoln Park Conservatory and zoo, but the striping is barely there. Notice that non-metered, non-permit parking is allowed just a few feet away from the edge of the crosswalk, making visibility terrible. Here's the view of the same invisible "crosswalk" at Belden from the viewpoint of a driver on Stockton, cresting over the hill going 30 mph. Alderman Michele Smith has put in a request for various improvements to this crosswalk, but I'm not sure what the timeframe is. Safety improvements are long overdue. I just don't understand why Children's Memorial Hospital can evacuate its operations from the Lincoln and Fullerton site, but still park their oversized vehicles on Lincoln Avenue every single day anyway, partially blocking the bike lane. Am I the only one who is irked by this? Potholes. Some have told me I should welcome them as natural speed bumps that slow down drivers. 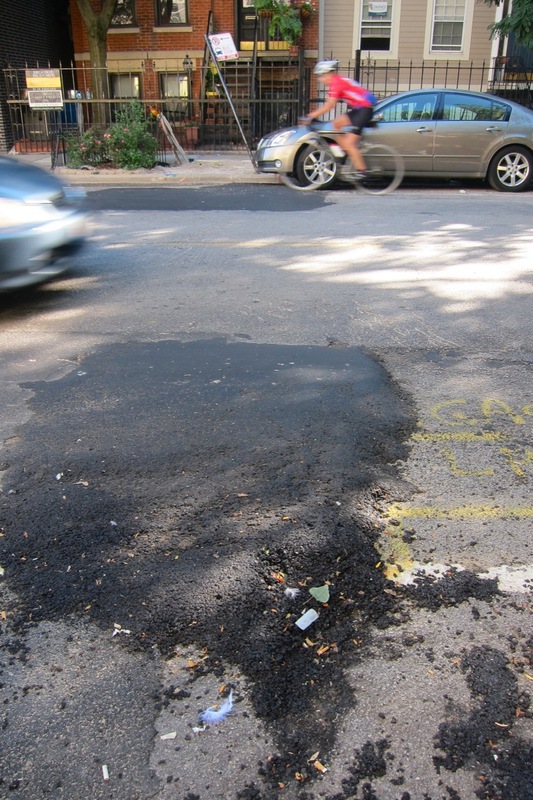 Yes, I've published this photo before, of the potholes in the west side bike lane on Lincoln Avenue north of Armitage. They're still there. They've been there for YEARS. The story we have is that Lincoln is a state route, so CDOT can do striping but not resurfacing. Then, on Lincoln just south of Armitage, some workers (not sure which agency) did a patch job of a pot hole in the bike lane, and they slopped on a mound of asphalt haphazardly, and then FAILED TO SMOOTH IT OUT. This picture doesn't adequately reflect the resulting four-inch-high bumpy, garbage-collecting disaster that it is. Riding over it is like mogul skiing on my bike. I notice this type of sign "fail" all the time. Is it a prankster who loosens the top screw? Someone planning to steal the sign but gave up? Regardless, the symbolism is not encouraging. You won't see any pictures like this in the city's Pedestrian Plan. I hope I didn't depress you. Yes, I do report things that I see all the time, to 311, to 911, to CDOT, depending what it is, and I hope you do as well. Or leave an encouraging comment below! See you on the street. Depressing, sort of. Frustrating, yes! I notice these problems as I ride around both in Lincoln Park and other parts of the city, but reading this was sort of like being hit over the head. Even in this "bike friendly" time, our infrastructure is sorely lacking. Maybe cyclists and pedestrians would be better off if money was spent on fixing what he have instead of adding new?